Life size wooden Angel + leather and pigment. Carved from eucalyptus, lime and pine. 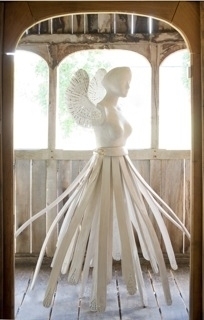 Life size sculpture of a female angel in wood and leather and pigment. This sculpture is typical of Jilly Sutton's work and has been exhibited at Buckfast Abbey and will be at Exeter Cathedral in 2014.